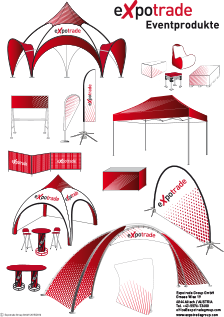 To be able to close your dome tents to protect the inside from weather conditions expotrade offers you the expodome sidewalls. Depending on your need there are different versions like the closed ones (standard), the ones with a window (panorama), the ones with a window and a door (panorama with door) and for those who like a combination of standard and panorama there is the special panorama with curtain. The last mentioned version has the feature to close the window with the curtain to prevent people from looking inside the tent. One of the main purposes of the sidewalls is to protect the inside of the tent from rain and wind and therefore create a comfortable atmosphere. 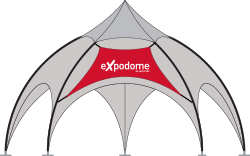 The expodome sidewalls get easily fixed with a zipper either directly on the cover or when you have a larger dome (4,8 m / 6 m / 9 m) you can fix it on the outside of the visor. 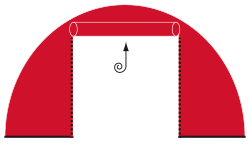 As the outside sidewall has a bigger radius, the inside sidewall is not compatible and therefore you should precisely tell us what kind of expodome sidwalls you need. We need to know if you want a sidewall for the inside or the outside (on the cover or on the visor). To avoid a mix-up of the different sidewalls the carrybag where they are put in is labeled with the type and the size.